Unix Shellprogrammierung – an introduction, unfortunately german only. Lieber auf Deutsch? Hier lang. Today I learned a cool new trick, made possible by the Item Preprocessing that is available since Zabbix 3.4. This is not a Zabbix blog, but I consider this so useful and so not-intuitive that I just have to write it down. 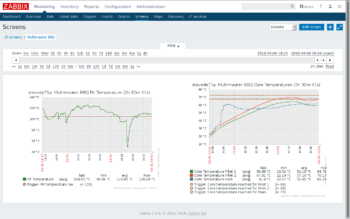 For the occasional visitor: Zabbix is an open source enterprise class monitoring solution. I use it not only at work, but also at home — not only to monitor the meat on my BBQ. In my opinion, Zabbix is really great when it comes to anything that can be expressed in numerics. It can also handle string data, but having had minor problems with that I try to avoid strings whenever it is possible. States can be expressed numerically and stored in integer values, using value mapping it is possible to show the states in a meaningful way. Today I came across a problem that I wasn’t able to implement at first. A web service told me the state of an application, which could be either RUNNING, STOPPING or STOPPED. It’s easy to create a string-item to handle this, and to implement a trigger that notifies if the service is STOPPED. However, in this case I had to create a trigger that tells if the service is in the state STOPPING for more than a certain time, indicating that it might have a problem shutting down. I couldn’t find a solution to this, since the trigger function str("STOPPING",15m) would trigger if at least one of the values during the last 15 minutes was “STOPPING”. Item Preprocessing to the rescue! Zabbix 3.4 brought a feature called Item Preprocessing. A value can be fetched, and before it gets stored it can be dissected or converted in several ways. One of these is, to apply regular expressions to the fetched value, in a “find and replace” kind of way. First, attach a “dictionary” to the value: replace the full value (. *) with with itself, followed by the replacement values: \1:STOPPED=0:STOPPING=1:RUNNING=2. Then, replace the regex (STOPPED|STOPPING|RUNNING)(?=. *:\1=(\d)) by the value of the second capturing group \2. In this way the item can be configured as an unsigned integer, since there are only the numbers 0, 1 or 2 that have to be stored. And I can apply the usual trigger-function-magic to notify if the value is 1 for a certain length of time. Added benefit: I can use the graph view of this item to see if there were any deviations from the wanted “RUNNING” state, when they occured and how long they lasted. I’m pretty enthusiastic about this way of processing the values. But I’m also very interested in opinions: is there a better way to deal with this problem? Something obvious that I haven’t seen? Unfortunately, this project is still work in progress. But I want to tell of the first test run anyways. The electronics didn’t do exactly as it was supposed, but you see where this is going. 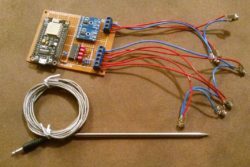 About two years ago, I built a prototype of a BBQ thermometer, which I showed here (german only, sorry). It really was just a quick hack, not really intended for repeated usage. I have learned a lot since then, and now I want to build something like that, but this time as a ‘real project’. Being able to measure core temperatures of multiple pieces of meat, I didn’t have to think about the project’s name for long: Multimeater! 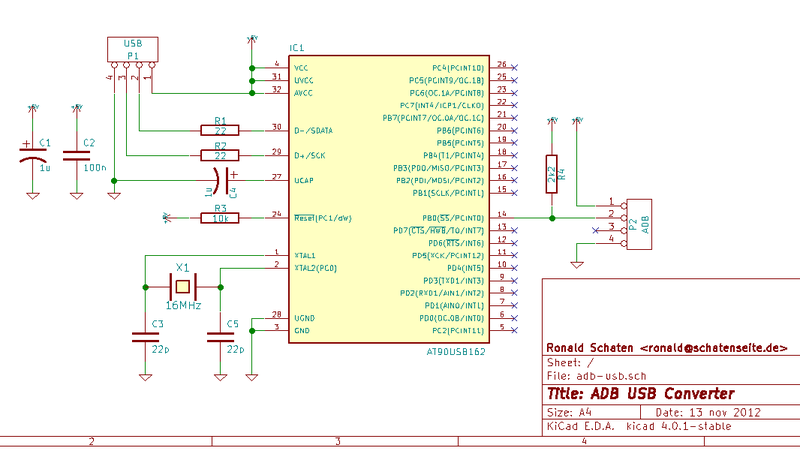 Like some of my last projects, this is based on an ESP8266-module, with software developed in the Arduino IDE. So it already runs WiFi. My firmware is — as in some of my other recent projects — based on the Homie-framework. It sends collected values via MQTT to my broker, from there they are delivered to Zabbix. Values are measured with two high temperature sensors each connected to a MAX6675, and four common meat thermometers on a MCP3208. Six temperatures? Yes. The plan is, to acquire the inner temperature of the pit on two positions. Under certain circumstances, these temperatures can be too high for the meat sensors. So I take two separate sensors for this, one on each end of the pit (which is a bit lengthy on a smoker, so there really is a relevant bit of a temperature drop in between). And with four meat thermometers I can monitor core temperatures of — you guessed it — up to four pieces of meat. Zabbix is usually used as a monitoring software for server systems. But it doesn’t just work in enterprise environments, I am collecting some… let’s say unusual values at home. In this case, I just used it to see graphs of the temperatures. But if I’m really starting to smoke me a pulled pork over night, I can tell Zabbix to wake me up if temperatures are out of a predefined range. As mentioned, today’s run was just a test. And of course, several things didn’t work out as they were planned. I had a problem with the high temperature measurements in the pit. Those values turned out to be completely useless. But since I just bought three pieces of meat for today, I was able to use the fourth meat sensor for the pit temperature. Then I misplaced the sensor in my piece of ham, so the graph looks a bit strange. And to top all this off, heavy rain poured down during the test. Currently, there is no roof over the smoker, so that didn’t make it easier, either. All in all, everything looked quite promising. I keep bringing this forward, and as soon as I really get it to work I’m going to publish it here, of course with circuit and firmware. Oh, and since I’m sure that I’ll get that question: technical problems aside, I had some awesome pieces of meat from this test. Everybody really enjoyed it. In early 2014, we renovated our living room. One wall got a rocky structure, and I thought that was the perfect place for a grazing light from above. This screamed for LED-strips. Fooling around with my daughters, I mentioned a plan of installing a pink light. The plan was to go with warm-white, but they insisted on a pink light… two against one, I was in defense position. Theoretically, a simple RGB-strip can be made to give white light. Practically, most times that’s a really ugly tone of white. So I installed a warm-white strip next to the RGB one. The controller that was delivered with the RGB-strip wasn’t able to power this combination, so I needed a RGBW controller. I couldn’t find an affordable one, so I had to build it myself. If I remember correctly, that was my first Arduino project. And it was surprisingly easy to do. I built a first prototype with an Arduino Uno, and with the great infrared receiver library by Ken Shirriff I was able to control a RGB and a white LED after just two hours. Using my trusty Logitech Harmony, which also controls the rest of my media system. The second prototype I built using MOSFETs, to test how I would be able to control the LED-strips with an Arduino. They are powered with 12V, after all. 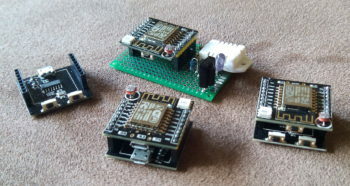 The final build is pictured on the photo above: an Arduino Pro Mini (the one without USB interface), and a simple PCB that is wired for controlling the strips. There’s an infrared receiver wired to the Arduino. 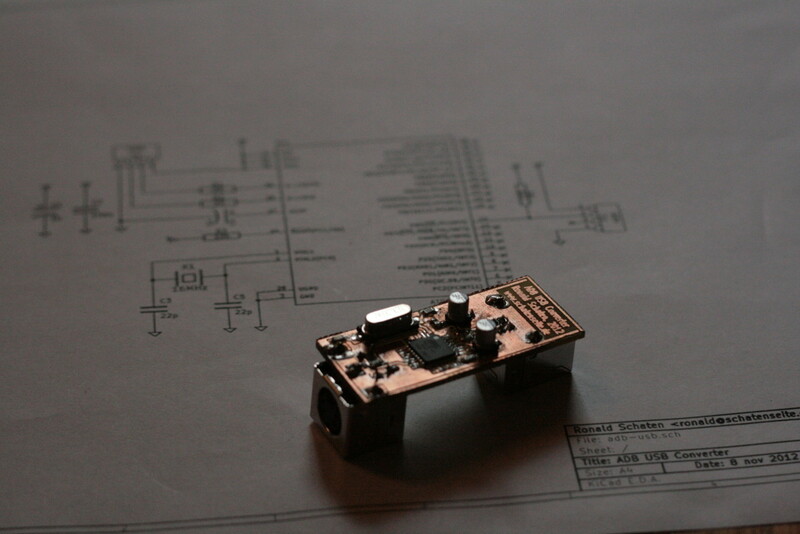 Initially, that was a TSOP31238, but I fried it just before finishing the project by wiring it wrong. Wanting to get this done, I gutted an old DVD player. I don’t have the slightest idea what type of receiver this is, but it works. That means: it did work. Almost exactly for two years. Till today. Now it’s obsolete — as I said. Sources and documentation go by the name of IRlicht, I published today. 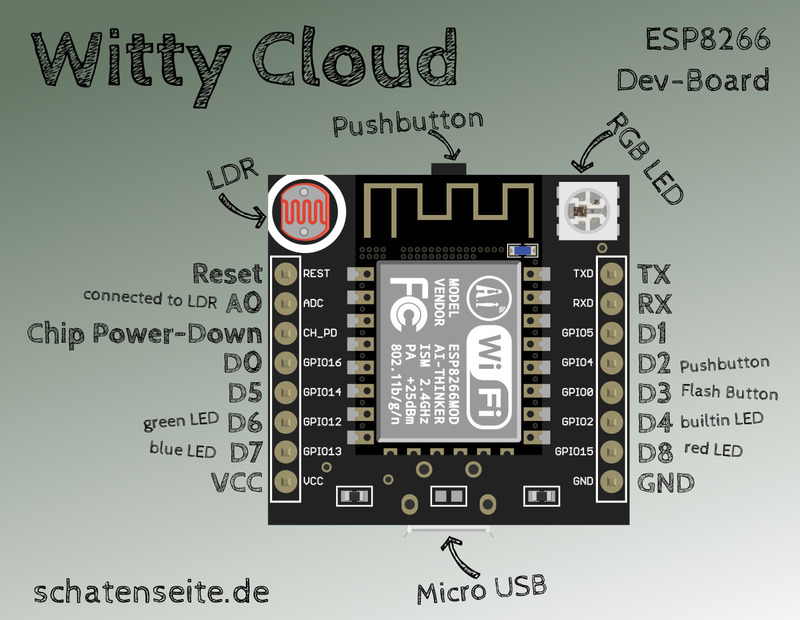 The ESP8266 is an interesting chip, I mentioned it here several times (sorry: mostly german). In a short description, it’s a freely programmable microcontroller. Compared to Arduino & Co., it’s a real number cruncher. The ESP is faster, has more memory, and the best thing: it has builtin WiFi. You’ll find more information all over the network, a basic overview is contained in Wikipedia. I tested several boards when playing with this chip. Today, I want to describe one that goes with the name Witty Cloud. Basically, it’s a board with an ESP-12-F, a USB connector that delivers power, a little pushbutton, a LDR (Photoresistor) and a RGB-LED. So there’s plenty of hardware to play with. When you buy the module, you receive a stack of two PCBs. The lower one has a second USB connector, which is equipped with a serial converter. So it’s not only used as a power source, but also as a programming and debugging interface. Furthermore, there’s a reset- and a flash-button on the lower board. 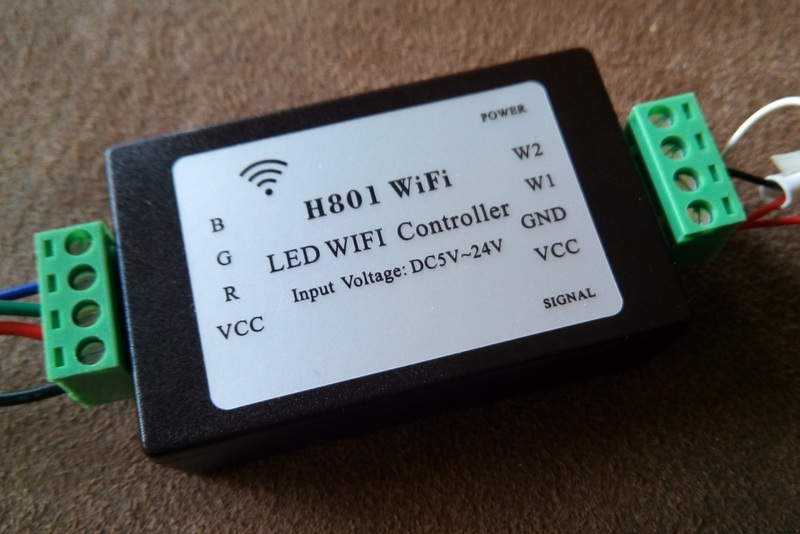 After programming, you just need the upper board, and you can even send newer firmware versions to it over the air (OTA). Stacked like this, the module costs less than three Euro, you just need a USB cord and a compiler to start programming. I suggest using the Arduino IDE, it’s very easy to use, even for beginners. After installation of the ESP8266 extensions, it’s best to select WeMos D1-Mini in the board manager, this way everything works fine. Unfortunately, it’s not easy to find proper documentation for the Witty. So i scribbled the picture above, at first to have some kind of reminder for myself. So the pin labeled GPIO13 is connected to the blue channel of the RGB-LED, in the Arduino environment it’s called D7. I would be highly interested in a circuit of the board, and if you have any corrections or suggestions: just let me know. Mein Fazit: ein echt interessantes Board. 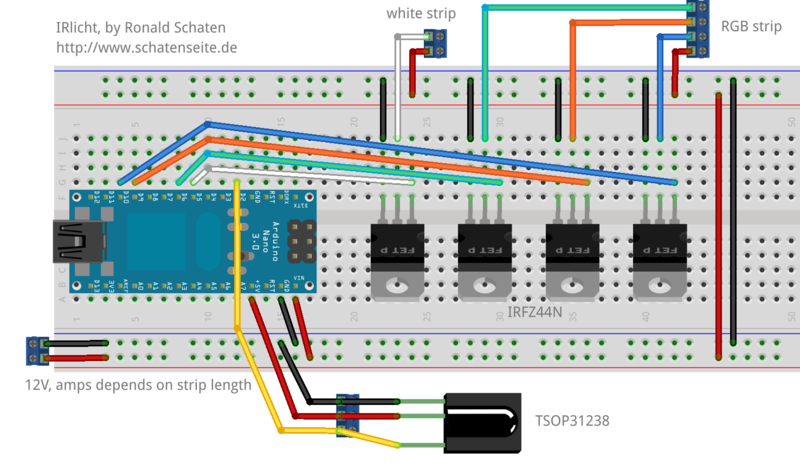 Wer mehr GPIO braucht sucht vielleicht lieber nach einem NodeMCU, wer sowieso einen LDR oder eine RGB-LED braucht sollte zugreifen. Ich habe mittlerweile einige davon hier, und eine Firmware mit der ich die Dinger hier im Haus verteilen möchte ist auch fast fertig. Oh, das Bild habe ich übrigens mit einer Grafik aus diesem Projekt gemacht, das ist die Witty Cloud für Fritzing. This is a project from 2004. I had it covered extensively on my old homepage, including some more pictures, circuit diagrams and a description on how I analyzed the keyboard controller. Nowadays, PCs don’t have a PS/2-interface anymore. 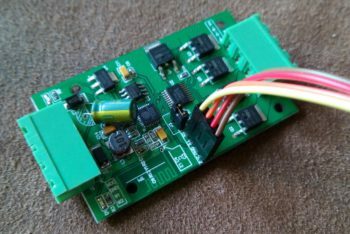 I’d base a project like this on microcontrollers if I would do it again, and interface the computer via USB. So I leave the details in the past and give just a short description of the project. At that time, I was interested in MAME, the Multi Arcade Machine Emulator. You can play all the old arcade game classics with that. A PC keyboard is not the ideal interface for thos games, so I started building my own controllers. Originally, the joysticks were sold to fit a Sega Dreamcast console. I threw out the electronics and implanted a PC keyboard controller instead. I had to find out the keyboard matrix layout and interface all the joysticks microswitches to the right contacts on the controller board. Not too complicated. 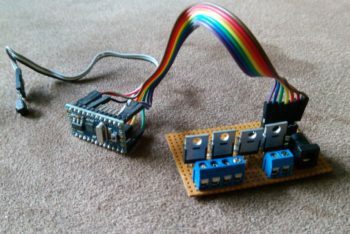 The second player’s contacts were connected to a second unit with an old serial cable. Additionally, I built a Y-adapter for the PS/2-interface, so I was able to control the PC outside of MAME. The result surely wasn’t a pretty build, but: it worked. This is another old project, dating back to about 2004. I had it covered on the old Schatenseite, and I want to give a short presentation on the blog to preserve it. I was given an old Commodore C64 that somebody decided to dispose of. The first version, in germany this case is dubbed ‘Brotkiste’ (bread box). It didn’t turn on anymore, and lacking any personal Commodore history I didn’t hesitate long before taking it apart. Unfortunately, I didn’t know about microcontrollers at that time, otherwise I would have been able to save the functionality of the keyboard. I wasn’t able to, so parts of the underside of the keyboard had to go, to make space for CPU cooler and RAM. I inserted a VIA EPIA M10000b, so the C64 ran at 1GHz. The system was completed by 256MB RAM, a 2,5″-20GB-harddisk, a CD-ROM from a notebook and an external power brick. I mentioned this project in an article (german only) on this blog, it dates back from November 2012. Somehow I never showed it, I don’t really know why. Those who read this blog for a while know that I have a deep faible for computer keyboards. You don’t get the full picture from my english language articles, but in german you can find many keyboard related articles on this site. 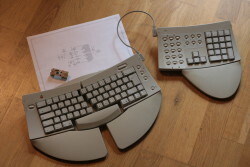 Amongst others, my collection contains two vintage Apple keyboards. There’s a — really not too shabby — Apple Extended Keyboard II, which was built between 1990 and 1994. Many enthusiasts claim that this is the best keyboard ever produced by Apple, partly of course because of it’s mechanical nature with the Alps switches. However, I wanted to give both a try. And since I don’t have access to a computer with ADB interface — Apple killed it in 1999 — I needed a converter. You can buy this stuff, but you don’t have to. On geekhack.org, there’s a japanese developer called hasu, who is tmk on Github. He created and published the TMK Keyboard Firmware Collection. That’s a firmware that can be run on several AVR-based platforms, notably the Teensy 2.0 which is well known in keyboard communities. 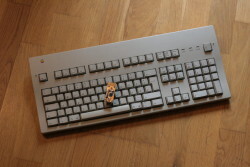 The firmware is able to ‘talk’ several different keyboard protocols. Of course, USB in one direction, to be connected to any modern computer. In the other direction there are protocols like PS/2, Sun or Apple Desktop Bus. The custom firmware is loaded with features even expensive modern high end boards fail to deliver. 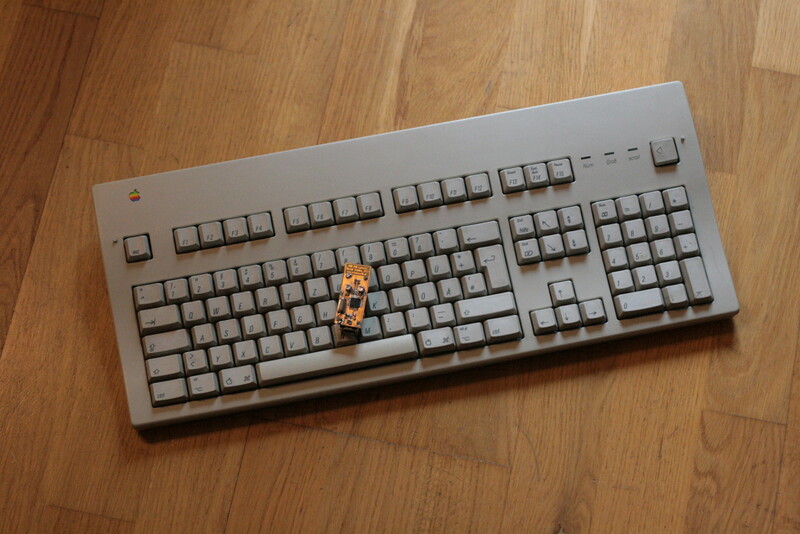 It’s possible to program macros, use media keys or control the mouse pointer with the keyboard. 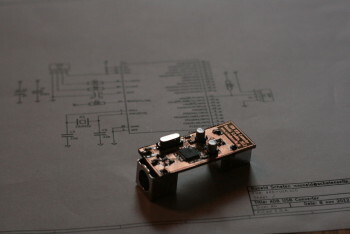 The finished converter measures in at 2x5cm, that’s really tiny. But the important thing is: it works! Data, from your own experience of performing Ebenezer Scrooge, you’re aware how fear can be a very powerful motivator. […] And in the hands of a con artist, fear can be used to motivate obedience, capitulation, the exploitation of innocent people. And that is what I believe has happened here. The episode is from 1991, and everybody can decide for themselves if this quote fits into our current reality. For me, TNG always has been the best part of the Star Trek franchise. I’m running my blog since 2004, and I think most of my content fits better into a blog than into a classic ‘homepage’ format. So old projects are ‘fading out’, instead of me taking them offline. So I moved my blog to the main page. 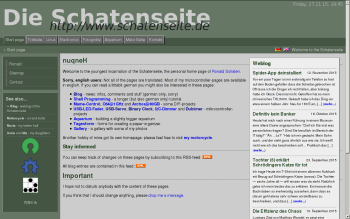 I preserved parts of my old homepage by ordering some articles into the blog. I kept chronoligical order with this, so what I wrote in 2006 will be found in 2006, even if I copied the content in 2015. I put a sticky article onto the front page, so it’s easy to find the main project pages. 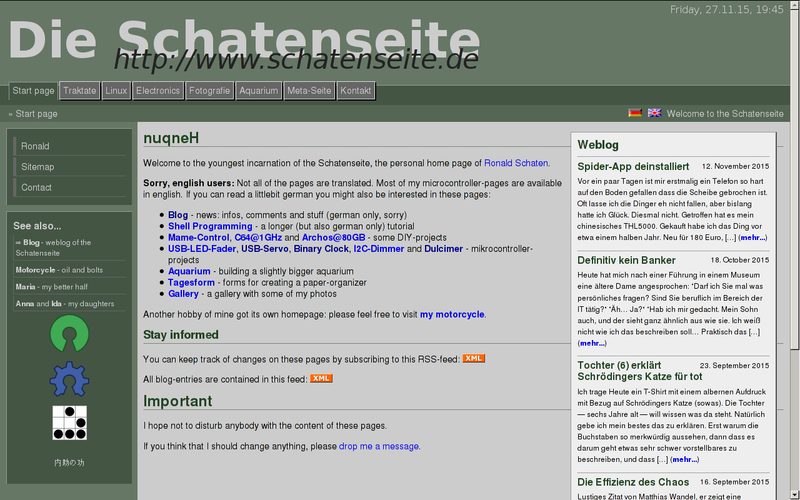 There’s one more thing I introduced to the blog: parts of the old homepage were already translated into — my very broken — english. I want to expand the english part in the future, so from now on this is a bilingual blog. However, not for the whole content. I like how WordPress keeps the page with the Polylang plugin. I don’t have to translate every single article. But rest assured: the main parts will be available in english, too. I’d really like to hear what you think about the relaunch. Especially of course, if there still are errors to fix. Does the page look OK? Do the feeds still work for you…?